Today I am going to explian how it’s possibile to create a linked index of a document. All of us know the importante of indexes in written documents. But if this documents are stored electronically (tipically in PDF format) it’s nice to have a clickable index, which immediatly redirects you to the part of the document you are intrested in. To easily created an index the quickest way is to format your index entries through the most intuitive instrument: Headers. You can find this options in the toolbar Formatting (View->Toolbars->Formatting). On this toolbar you find the Heading style I am talking about. As you can see you don’t just have one heading, but at least three. Heading 1 is to be used for the most important titles (es: chapter titles). After this you can use Heading 2-3-4 to create your gerarchy. Once you have created your documents structure is time to create the index. A small window will open. That’s the window which lets you control your index. Give your index a name and move to the tab named Entries that’s the one which matters for our scope, which is to create a linked index. Click on the “E#” button. Click on the “Hyperlink” button. The label of “E#” is now changed to “LS” which stands for “Link Start”. 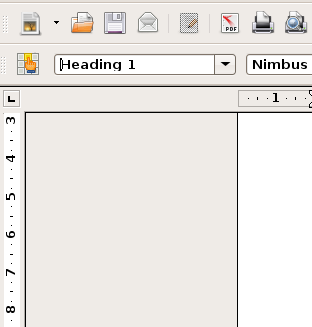 Below select “Page number” from the Character style. Click now on the small textbox after the last entry of the line structure, “#”. Click now on “Hyperlink” again. A new piece should be added and it’s label should be “LE” (Link End). The last thing to do is to click on “All“. This will apply the newly created structure to the whole index and not just to the “first level” (Heading 1). Click now on “OK”. Your index will now be inserted in your document and the entries will be clickable. When you will click on the entries you will automatically been redirected to the specific header. In order to try links in OpenOffice you have to click on the index entries while you keep CTRL button down. You can now for exemple export your document as PDF and have a really nice clickable index in the PDF format! Small tip: to automatically update your index after some changes you do in the doc’s structure just right-click on your index and select “Update Index/Table”. Thank you for explaining this unintuitive interface! Great!! very explanatory, thanks for sharing!!! Genius!!! But what about the page numbers in the index?? Thanks a lot. its truly very un-intutive interface. this is a great resource. I am currently working on a 250-pages document and a clickable index is a must in this case. Tanti saluti a bella Italia. Thanks ! It’s utility for me ! Still usefull 🙂 thx to you I quickly made a clickable index. It’s also possible to click between the different parts and thus create a more clean link. For instance clicking before E# and then pressing hyperlink and then between E and T and pressing hyperlink. This makes sure that only the chapter number and name are blue linked. You can also click on E#, E, T and # to remove it by pressing the delete key. This creates a linked Table of Contents, NOT an index. If you change the Type to Alphabetical Index the Hyperlink button disappears. I need a quick solution, please help me. I am using two different styles of page numbering (roman, and normal) but this index only shows in arabic numbers. I cant find anything to change…. Thank you for saving us hours of frustration.